"For generations men have dominated every power, every narrative. We're standing in our power and we're claiming our space," said the first black congresswoman from Massachusetts. 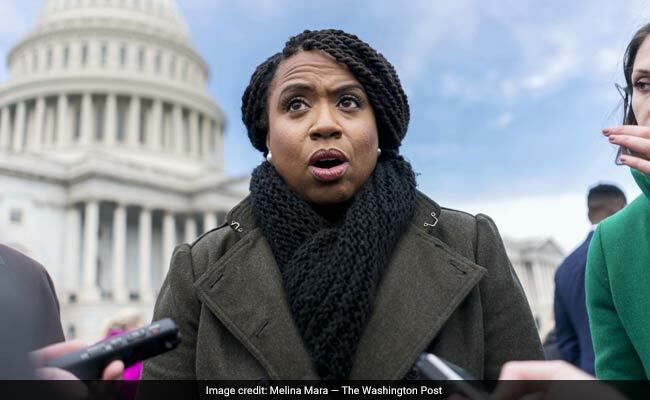 Ayanna Pressley got her start in politics after enrolling in Boston University 1992. From the outside, Room 1108 in the Longworth House Office Building is unremarkable. Inside, it's even less so. But to Ayanna Pressley - who is the first black woman to represent Massachusetts in Congress - it is everything. The office symbolizes a kind of spiritual lineage for her: Fifty years ago, the space was occupied by Shirley Chisholm, the nation's first black congresswoman. "This is it! This. Is. It. OK? Come on, this is it! I love the vibe," boomed Pressley, as she strode in for the first time a few weeks before being sworn into office as part of the most diverse freshman class in congressional history. "I love the floor plan. I love the history." For a space with such pedigree, Longworth 1108 is almost comically cramped. Open the front door too quickly, and you might thwack an aide. Still, Pressley said she felt "an immediate soul tie to this space." Chisholm, who represented her New York district from 1969 to 1983, is a political icon for liberals and a kind of figurative godmother for Pressley. But Pressley wasn't supposed to get Chisholm's office. She drew an inauspicious lot during the House room lottery (which took place on Chisholm's birthday, as Pressley proudly told the audience at the drawing). She shrugged, her disappointment at the bad draw was evident, and later squatted in the office and feebly tried to keep other congressional freshmen from scooping up the space. "Lots of mice in here!" she and an aide joked at one point in an attempt to deter others who stopped in. When another freshman, California's Katie Hill, inadvertently selected the room, Pressley had to settle for a fallback. But later, during an orientation session, Hill offered to swap offices with Pressley. What had at first seemed out of reach was now hers. For Pressley, 44, the beauty of the unexpected win is now a familiar experience. In 2009, she was the first African-American woman elected to the Boston City Council, beating most of a large field that at one point swelled to 15 candidates vying for four at-large seats. But just two years later, she was cast as a political underdog in her first re-election battle. "The victory was an extraordinary feat for a first-term city councilor who had been expected by many to lose her seat," the Boston Globe wrote in 2011. When the results were tallied, she was the top vote-getter in all the at-large city council races that year. "It was not a fluke," she said at the time, and the women of color who have since been elected to the city council credit her with paving the way. In 2018, Pressley was once again the underdog when she challenged longtime Rep. Michael E. Capuano in the Democratic primary, an unusual move in Massachusetts politics. Pressley had a reason for skipping her place in line, said Lydia Edwards, a Boston city councilor. "You cannot assume the same political machine that produced the same kind of politician - ethnically, in terms of gender - will suddenly produce you. You have to see that path, and form your own." Pressley campaigned against Capuano - a popular liberal - by making the case that it was time for generational change and that the state's only majority-minority district should see itself reflected in its representative. Her slogan: "Change can't wait." After Pressley secured Chisholm's office, one of the first things her staff did was tape to the walls an illustration of Chisholm that had been colored in by Pressley's goddaughter. The sketch of Chisholm's portrait, curls high atop her head, her face frozen in a serious stare, wasn't far from a poster with a drawing of Pressley, who wears her hair in twists and can effect her own unflinching gaze. The late congresswoman was elected in 1968 and represented Brooklyn, and when she ran for president, her slogan was "Unbought and Unbossed." Pressley set about building a career guided by Chisholm's example and other groundbreaking women, such as the late civil rights leader and congresswoman Barbara Jordan of Texas. She got her start in politics after enrolling in Boston University 1992. After her mother fell ill and lost her job, Pressley dropped out to support her and found work with former repersentative Joseph P. Kennedy II, and later John Kerry, when he was a U.S. senator. As an aide to Kerry, she advocated for constituents who didn't typically get - or even request - attention from Washington's most powerful. "She came to work with her conscience helping her to guide her where we ought to go, what we ought to be doing," Kerry said. "An example would be Pine Street Inn, where homeless people and folks with serious challenges were finding shelter." The organization helps provide housing and emergency services in Boston, and in 2003, Kerry delivered an address to graduates of its job training program. "She thought it was just as important to listen to them as it was to everyone else, and she was dead right," he said. There are many political stars in the class of freshmen elected to Congress last year. Some are new to politics. Many will burn bright and fade. Pressley, who has worked in politics for more than 20 years, could be in Washington for the long haul. She also arrives at a unique political inflection point along with the most diverse, and most female class in history. Decades ago, as Chisholm herself ran for president, she issued the challenge that "we cannot continue to take things as they are, when we see around us that government is not responsive to certain segments of the population." Pressley said she wants see that vision made reality. In December, she made headlines for her frank remarks at a fundraising meeting for the Democratic National Committee, warning them not to be complacent about their electoral gains and to "ask the tough questions about whether or not we provided" women and candidates of color with support "so we can break through more glass and concrete ceilings as rapidly as possible." Already Pressley's become part of tightknit group of liberal House freshmen known on social media as "The Squad," including Alexandria Ocasio-Cortez, D-N.Y., Rashida Tlaib, D-Mich., and Ilhan Omar, D-Minn. These liberal women have collectively pushed Democratic leadership to consider policies such as gun control, Medicare-for-all, and a "Green New Deal" focused on addressing climate change. After Omar posted a photo with Pressley and other women on Instagram with the caption "They ain't ready," it went viral. "For generations men have dominated every power, every narrative," Pressley said. "We're standing in our power and we're claiming our space and it's about damn time." Their first challenge was a monumental one: They'd entered some of the most rarefied halls in government as that government remains partially shut down. It gave Pressley - who tends to speak of her vision of government in sweeping, intersectional terms and rhetorical paragraphs - a very specific problem to attack. She wrote to congressional leadership to demand janitors and food service workers in the government's employ receive back pay. Two days later, she took to the House floor and slammed Trump for the shutdown's impact on federal employees. "I see right through you and so do the American people," she said. "I rise today in solidarity with the thousands of workers with calloused hands and broken spirits working for no pay." The minute-plus speech, delivered in her signature, deliberate cadence, was (politely) censored by a House colleague for her direct attack on Trump. But no matter: It triggered dozens of headlines and hundreds of thousands of views on social media. Last week, Pressley left Chisholm's old office - the first of several offices the late Congresswoman had on Capitol Hill - to march in the cold with furloughed federal workers. As they strode to the gates of the White House, she spoke with marchers, and reporters flocked to her, hoping for a sound bite. She couldn't provide the workers present with much more than that because of the impasse between her party's leadership and Trump. "It is true that it's unlikely that anything that they're proposing right now is going to become law," Michele Swers, a politics professor at Georgetown University, said of Pressley and other progressive freshmen elected last year. "Realistically, what they can hope for now is to try and set the agenda in a way that's going to influence future policy. You kind of lay down markers of, if Democrats have control, this is what it would look like." Pressley's approach may be futile, said Genevieve Wood, senior adviser and spokeswoman for the Heritage Foundation, a conservative think tank. "You're going to see a lot of grandstanding on the left, trying to get their voices heard, trying to fulfill promises (they made) on campaign trail," she said. Pressley did have promises on her mind on a recent Thursday afternoon. Her desk displays a black-and-white photo of her late mother, the community organizer and social worker Sandra Pressley. A single mother, she sacrificed to send her daughter to a private school and had sparked Pressley's love of Chisholm in the first place. Pressley's journey to Congress, in many ways, had begun with her. Propped against the wall was a drawing of Pressley and slogan she often repeats: "The people closest to the pain should be the closest to the power." She sat at the edge of her seat, behind a desk that was in front of a window that she likes to think Chisholm had looked out. The furniture is too big for the space. There are too few electrical outlets. Temporary walls have been erected to carve out a small office for senior staff. The office is by no means perfect, but it's still hers.